Brighton will look to end a five-game winless run in the Premier League when they host Burnley on Saturday. The Seagulls have failed to score in their last three home games, losing 1-0 to Liverpool in the Premier League and drawing 0-0 with West Brom in the FA Cup and 0-0 with Watford in the league. Burnley head into the game on the back of a 1-1 draw with Southampton on Saturday. The Clarets are unbeaten in six league matches, with three wins and three draws. Burnley beat Brighton 1-0 at Turf Moor at the beginning of December. They are 17th in the table, three points behind 13th-placed Albion. Albion will head into the game with confidence after winning 3-1 after extra-time away to West Brom in their FA Cup fourth round replay on Wednesday. What time does Brighton v Burnley kick off? The game gets underway at the Amex from 5.30pm on Saturday. Yes. The game will be broadcast live on BT Sport One. Coverage begins at 5pm and will run until 8pm. Highlights of the match will be on Match Of The Day at 10.20pm on BBC One. Several players will come back into Brighton's starting line-up after being rested for Wednesday's FA Cup fourth round replay at West Brom. Mathew Ryan will replace David Button in goal, while Martin Montoya, Lewis Dunk and Shane Duffy are likely to come in for Bruno, Leon Balogun and Dan Burn. Bernardo returned from a hamstring injury at the Hawthorns, so Seagulls boss Chris Hughton has a decision to make on whether the Brazilian or Gaetan Bong starts at left-back. Dale Stephens has missed Brighton's last two games with a hip injury, so could return in the middle of the park. Pascal Gross, Solly March, Jurgen Locadia and Glenn Murray are all likely to return to the starting line-up against the Clarets. Burnley midfielder Steven Defour and defender Matt Lowton could return from injury at the Amex but winger Aaron Lennon is set to miss out with a knee injury. Tom Heaton has established himself as the Clarets' number one in recent weeks, replacing Joe Hart between the sticks. Former Brighton players Ashley Barnes and Chris Wood are likely to feature against the Seagulls. Barnes has scored six Premier League goals this season and Wood has netted five times. 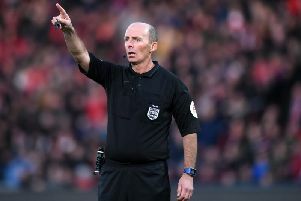 Stuart Attwell will be the man in the middle at the Amex. He has shown 43 yellow cards and one red in 13 Premier League matches this season. The assistant referees will be Constantine Hatzidakis and Simon Long, with David Coote the fourth official. Brighton are Evens to win on PaddyPower, with Burnley 11/4 and the draw 11/5. Burnley won 1-0 at Turf Moor against the Seagulls earlier this season and a repeat of that scoreline is 8/1. Brighton to win 1-0 is 5/1, while a repeat of last season's 0-0 draw at the Amex is 6/1. Albion top-scorer Glenn Murray is favourite to score the first goal at 10/3 and is 11/10 to net anytime. Florin Andone is 7/2 and 13/10 respectively and Jurgen Locadia is 9/1 and 10/3. Burnley top-scorer Ashley Barnes is 7/1 to score the first goal and 5/2 to net at anytime. Chris Wood is 15/2 and 11/4 respectively and new signing Peter Crouch is 9/1 and 10/3.